Does anyone have any new year resolutions this year? One of mine is to try and bit a bit more organised. I don't have a huge amount of space at home so trying to keep things tidy can be ticky at times, especially when it come to organising all my sewing and knitting bits and pieces. 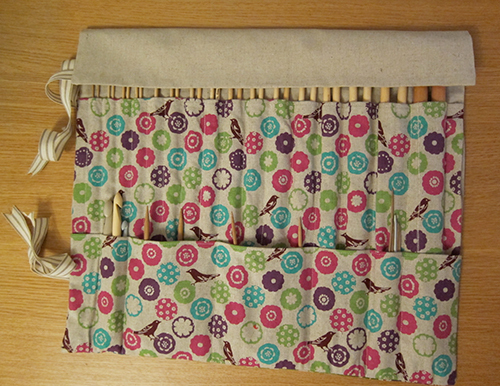 This knitting needle roll is a simple quick stitch idea to help keep your knitting needles and crochet hooks in order. It has individual pockets to slip your needles into and well as pockets for circular needles, stitch holder and crochet hooks and it rolls up and ties with some lovely ribbon! Read on to find out how to make your own! I used the Japanese Kokka Linen/cotton mix fabric for its sturdyness and vivid colours along with Essex Linen which tones in really well as a background fabric. You could use any type of cotton fabric but for quilting weight fabric I would recommend using a medium weight interfacing to give the case more body. You will also need: co-ordinating thread, pins, measuring tape, scissors, sewing machine, hand sewing needle and iron/ironing board. Cut out your fabric pieces. 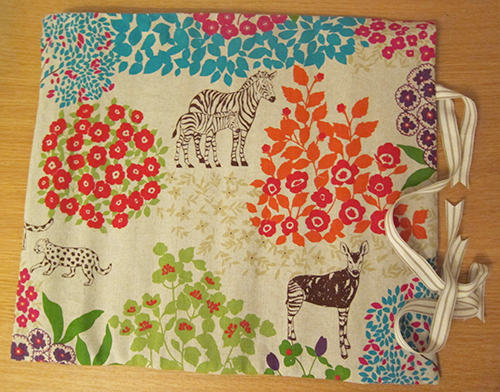 For the outer fabric (shown below as the one with the animals on it) - 46cm wide by 40cm. 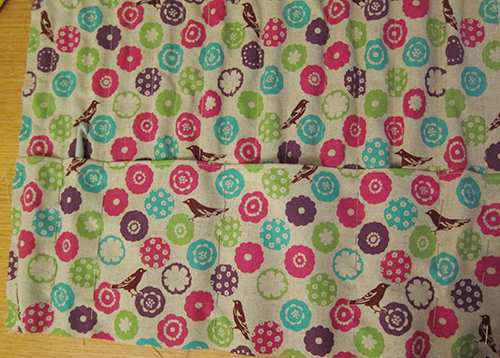 For the backing cloth (shown below in plain natural essex linen) 46cm wide by 40cm. 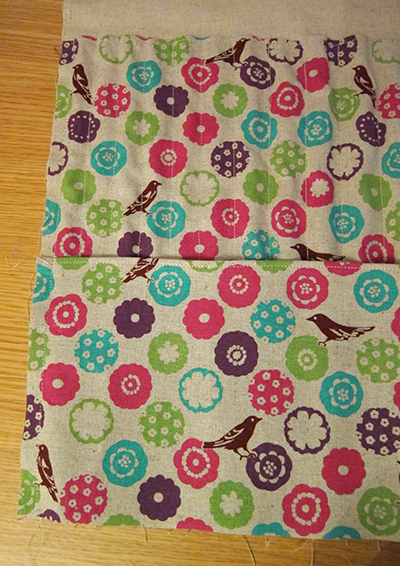 For the inside pockets (shown below in the spotty fabric with small birds on it) - 1 x back pocket 56cm wide by 32cm and 1 x front pocket 56cm wide by 18cm. 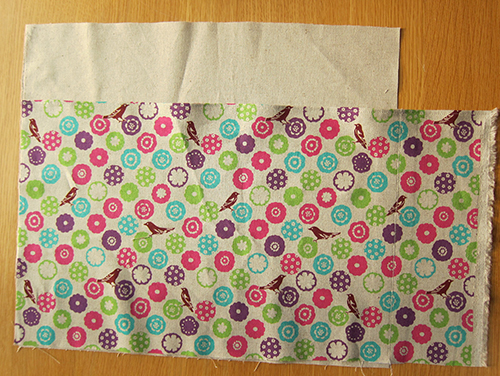 With right sides together, stitch the flap along both the short sides and one of the long sides. Turn the right way out and press. 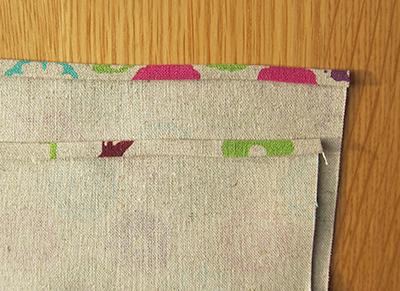 Finish off the top edge of of the two inside pockets. Press down the top edge by folding over the fabric 1/4 inch towards the wrong side and then fold over again ao the raw edge will be hidden. 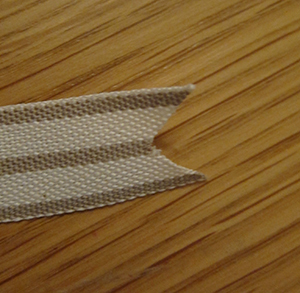 Then top stitch close to the edge as shown below. 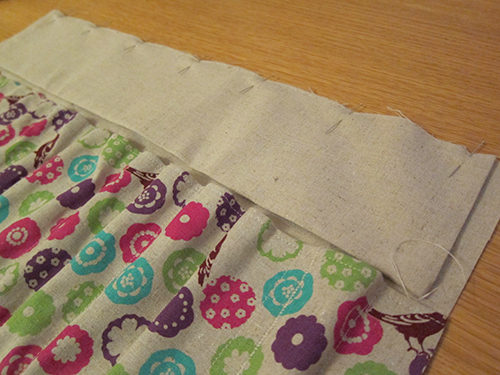 Place the back pocket on top of the plain backing cloth with right sides facing upwards. 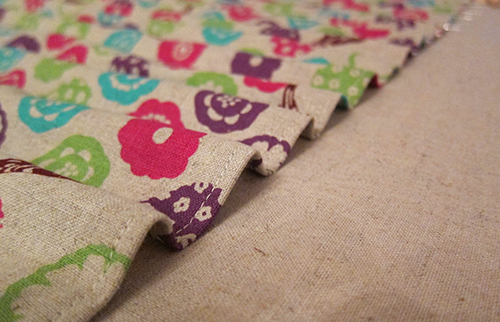 Then anchor the back pocket along the left hand edge by stitching 1/2inch from the edge. You will notice that the top pocket is wider than the backing cloth - this is supposed to happen and you'll see why in the next step. 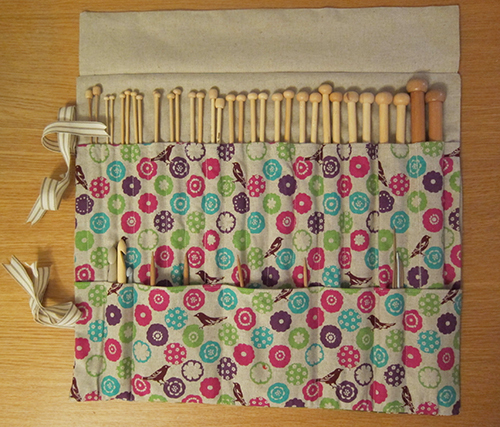 Now you need to create the individual pockets for the knitting needles. 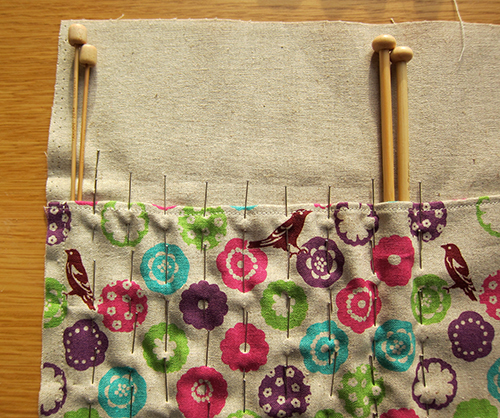 To do this you will need knitting needles of various sizes as the pockets will all be slightly different sizes. If you don't have needles of every size it doesn't matter. Have a think about what sizes of needles you use (or will use in the future) and make the pockets to suit your needs. As long as you have a narrow set (approx 3mm), medium (6mm) and thick (10mm) then you can just use these ones to create the different pocket sizes. Line up the knitting needles along anchored edge of the back pocket and pin all the way to the bottom of the back pocket ensuring there is a little slack over the needles. Repeat the process gradually increasing the size of the needle so that you end up with wider and wider pockets. 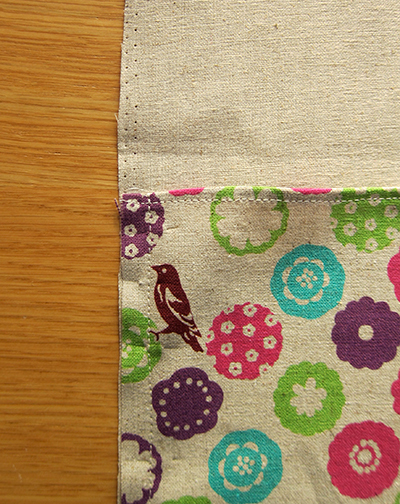 Make sure that you pin to the bottom of the back pocket each time, otherwise the back pocket fabric will end up wonky. 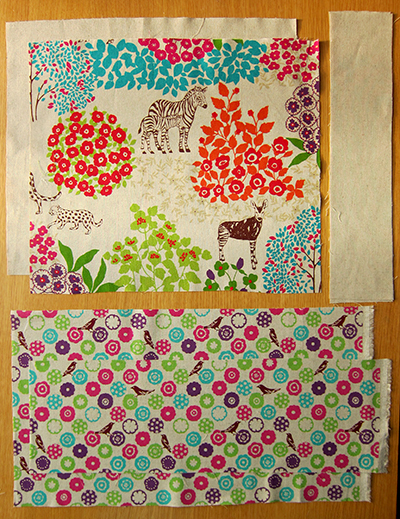 As you move along you will notice that the extra bit of fabric on the right hand side is gradually used up. Once you have reached the right hand side of the backing cloth and created all your skinny pockets, use the pins as a guide and stitch the back pocket to the backing cloth. Start your line of stitching at the bottom, stitch right up to the top, keep the needle down in the fabric, then rotate the fabric round 180 degrees and stitch back down the line that you just stitched until you get about half way down. This just secures everything and will make the case last longer. You'll end up with lots of little pockets and the back pocket looking all bumpy to accomodate the different sizes of needles. You will have likely used that section of over lapping fanric on the right hand side but of not, just trim the excess to line it up with the backing cloth. Repeat the above process for the front pocket. Anchor it first at the left hand side then using the other things you want to store in your case (crochet hooks, circular needles etc) create the pockets in the same way as you did before. The only thing you need to do is make each line of stitching co-ordinate with one of the stitching lines form the back pocket (otherwise you'll block up the back pocket slots). Now baste the top flap in place along the top edge of the backing cloth. 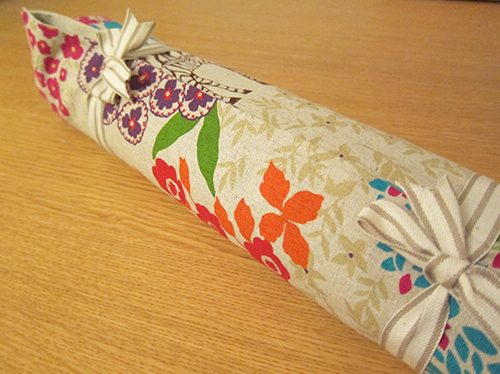 Attach the ribbon, but first create a 'V' shape at the ends as shown below to prevent fraying of the ribbon. Cut the ribbon in half so you have two strips. 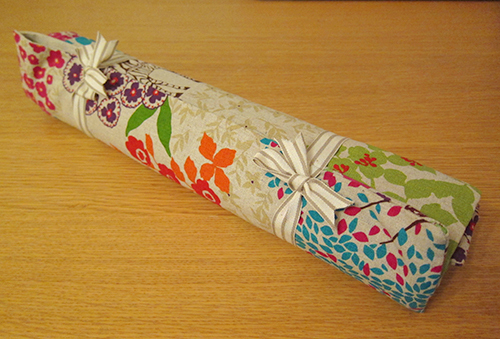 Then fold each of the ribbon lengths so the you have one short end (approx 15cm) and one long end (approx 35cm). 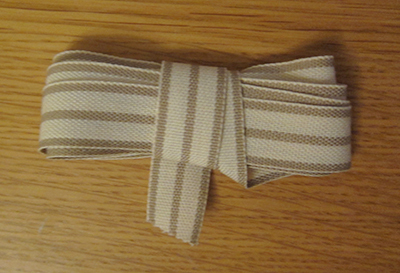 Baste the ribbon in place with the ends of the ribbon in towards the pockets as shown below. Place the front cloth on top of the backing cloth with right sides together and stitch all the way around leaving a 4-5 inch gap so tha it can be turned the right way out. Make sure you don't catch the sides of the top flap as you stitch around. 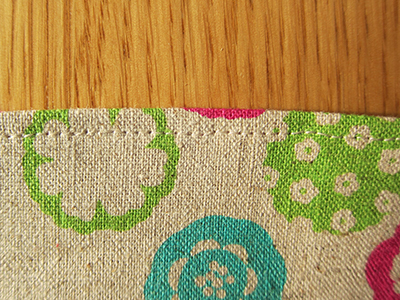 Turn the right way out, press and hand stitch the opening closed.